I always plant a bed of Blue Lake green beans in the garden. They taste great fresh, and even better canned. The bed I planted this year was 3 ½ feet wide and 32 feet long. I plant my seed about an inch deep and four inches apart in each direction. I planted in mid-march. I have stated before that you can get an unbelievable amount of produce from a small garden by using the bed planting method, and Blue Lakes are a good example of what I am talking about. After I picked and snapped the beans I had 30 quarts; this is off of a little more that a hundred square feet. Also, because green beans are an early crop (I picked mine at the beginning of June) that same 100 square feet of garden is now available for a second crop. I planted the same bed with purple hull peas. 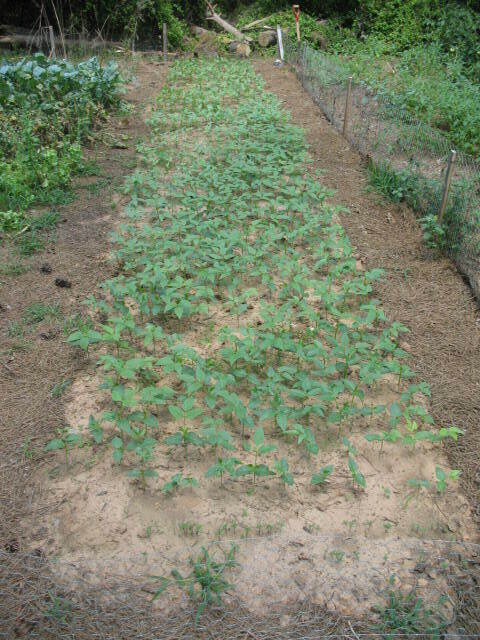 Pictured below: Former Blue Lake bed has been replanted in Purple Hull Peas. Don’t fertilize beans or peas. They produce their own nitrogen and actually improve the fertility of soil that they are planted in. After I have picked over my beans, I never pull up the vines. I cut them off at ground level. This leaves the roots and their nitrogen nodules in the ground. Green beans can be stored in several different ways. One is to make Leather Britches, a type of dried bean. To make Leather Britches, take the whole green beans and string them on a piece of twine. Use a needle to string them. Push the needle through the side of each bean about in the middle, then hang the string of beans up to dry. By the way, tying a knot in the thread when you start will not work. The beans will slide off. I usually tie a button or a small stick on the end of the string, and this keeps the beans on the string. They will keep for months without refrigeration. Too prepare the beans just slip them off the string into a pot of boiling water. Season with salt and pepper, and simmer for a couple of hours. They will not look like fresh or canned beans; they will have a kind of wrinkled leather-like appearance. Hence the name Leather Britches. Greens beans can be frozen and stored in plastic freezer bags, but you really need to blanch them for a minute in boiling water before freezing them. Blanching stops the enzymes in the beans from working and helps protect the taste. 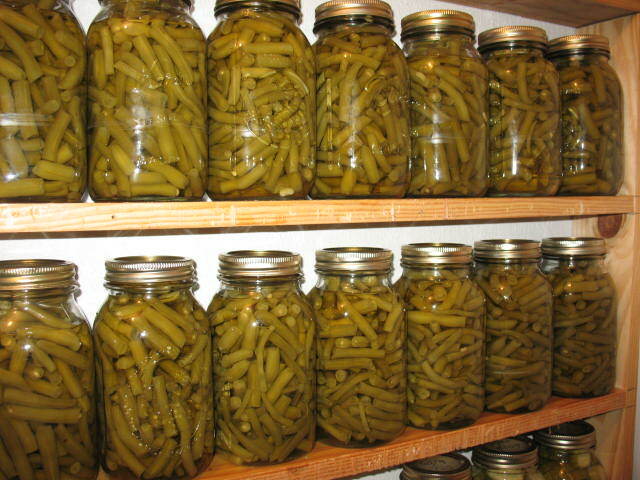 My personal favorite way to store green beans is by canning, but you must pressure can them. Don’t ever try to can green beans by using the water bath method. It will not work, and it is dangerous. If you have a pressure canner, follow the canning directions that came with it. If you don’t have directions, you can buy a USDA publication on home canning that will tell you everything you need to know. Pictured below: Home canned Blue Lake Green Beans in the pantry.